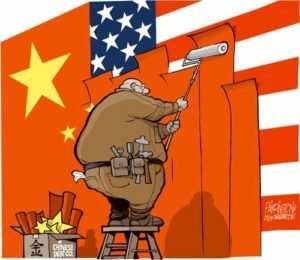 The Chinese Dream of Hegemony? Admiral Harris presents a strictly militarist perspective. This is the perspective of a person who views the world in Manichean terms: ally or enemy. Chinese Foreign Ministry spokeswoman Hua Chunying said admiral Harris was “obsessed with hegemony,” fearful that others might try to usurp it from the US. Given the words of the to-be US ambassador to South Korea, one can only assume that the Harris is either ignorant or he is implying that Xi is a liar. Hardly an auspicious start for a job posting that obviously calls for diplomatic skills. Even if there is substance to what Harris states, it would at best be a case of the pot calling the kettle black. Does China have the equivalent of a Monroe Doctrine (by which the US has granted itself preeminence — also referred to as hegemony — in the western hemisphere)? Are Chinese troops warring in Africa? Is China supporting a coup government in Honduras? Is China pursuing “regime change” in Venezuela? In Syria? Is China supporting the oppression and slaughter of Palestinians by Israeli Jews? Does Xi Jinping threaten North Korea with genocide? Has China ringed countries around the world with Chinese military bases? If China does not engage in such imperialistic acts, then who is actually acting a like a hegemon? This article was posted on Monday, June 4th, 2018 at 4:04pm and is filed under China, Imperialism, Militarism.